It's finally gotten chilly here in New York. We even had wet, windy weather yesterday, which called for woolen items on all extremities. (including wrapping an alpaca silk blanket around the sleeping-baby-in-a-sling (no way was I going to take her out of the sling, thus waking her up, to get her into a warmer individual get-up - we've had a rough few days here with the little one) to take Isobel to school. And poor Isobel has a cold (the oozy kind with a goopy cough), though she seems in good spirits most of the time. Not a lot of knitting around here, which, of course, doesn't help my mood. In doing the multitudes of laundry lately, I get to spend time *near* my stash (it's in a bookcase across from the washer/dryer) but no time with it, though I hear various skeins calling out. I am about two thirds of the way up the front of my niece's Aran sweater, and once that's done I can get cracking on some birthday (Isobel) and Christmas (everyone else) knitting. The second sock has turned into subway knitting reserved for Thursday evenings when I go to my writing class. Oh, in an "only in New York" moment, Isobel was scouted by a talent agency assistant Sunday on the subway, though the young woman said she usually works with five and ups, so we have a little time. On a lovely Friday afternoon in October in New York, we pledged our troth publicly, making official our long-standing private intentions. The bride wore blue and carried a peacefully sleeping babe. The groom wore grey and translated the reading from The Odyssey himself. Our ring bearer and flower girl also served as the paparazzi. And our dear friend performed the ceremony with grace and emotion, while our other dear friend (her husband) recorded the events in still and moving pictures and witnessed the marriage. Their son was the third paparazzo. The small ceremony was followed by champagne, red velvet cake, and sushi. Icarus seemed the proper choice of covering, as I'd started to knit it when Nick and I reconnected. Plus, the color, incidentally, was just right for the dress. Many thanks to everyone for their well wishes in the last post. Mods: Used sock yarn instead of Worsted, though this is the Heavyweight sock yarn. And I decreased one repeat of the lace out of each arm to make them snugger (and save on yarn), then knit the cuffs back and forth. What fun! I've made a bunch of February Baby Sweaters, so it was a no-brainer to knit this one up (along with everyone else). I'm not thrilled with my buttonholes, but I think that's my only problem with the sweater. It should be a useful knit to have this winter, since it's wooly yet lacey, and our apartment tends to be overheated. In more exciting news than an FO, I'm getting married tomorrow! The first time I knit a sock I didn't realize it was such a big deal for people. I decided to make a birthday stocking (like a Christmas stocking) for Isobel, so just a really big sock in worsted weight yarn: shocking pink Malabrigo to be exact. So soft and shockingly pink. I followed the pattern I had for normal socks (the great Family Socks from Yankee Knitter), using bigger yarn and needles but the same stitch counts for the sake of my sanity. Seemed kind of like no big deal. Why were some people so obsessed with knitting socks? And why were others so flummoxed by "turning the heel"? I guess I turned the heel. I mean, the thing had a place for a heel. Well, if you were a giant anyway. It's kind of like cooking. Why are people so impressed with a home-cooked meal. If you follow the recipe (and don't lose your head), you should come up with a reasonable facsimile of dinner. But people are so impressed when you follow directions. Does no one else follow directions? I'm the only one, aren't I. Being the good girl isn't always easy, but I do end up with a tasty dinner. And socks with heels. There are heel-less socks, though, called bed socks. Just a tube with a closed toe. They don't fit well in shoes but are cosy for bed or padding around the house. I haven't knit any of those yet, though I'm finally (three years later) making a pair of socks for myself. The yarn is a gorgeous colorway from Madeline Tosh called Twilight, with shocking pink (again with that color), navy, and brown and green in between: the pink of sunset-tinged clouds, the blue of the night sky, and the dusky shade of the trees as the light fades. These will be special socks just for me, unlike the socks I made for Peter. He was in rehab, and it seemed like the right thing to do, make him a pair of socks. I even followed the old wives' tale and knit a strand of my hair and one of Isobel's into the socks. It's supposed to bind the recipient to you. (Should have noticed the other one about knitting socks for your boyfriend: he'll walk out, but he was my husband.) So, it seemed like the right thing to do, since he was going to come back home. No one had asked me if I wanted him to. The good girl would, of course. Funny how that didn't work out. Making that pair for him. Does he still have them? Does it matter? The pair for me are knit differently, toe-up to use as much of the gorgeous yarn as possible and with a short row heel to avoid picking up stitches, which I tend to do badly. His were just a lesson in construction, and I've learned a lot since then. *I've just started a memoir writing class, and one of the exercises we did was to write about something we did for the first time. This was my essay. The photo is of the start of my second sock. I used Judy's Magic Cast-On, which I learned knitting up the Amy March Slippers around Mother's Day. It creates a toe that fits my pointy feet very nicely. And I used a short-row heel gleaned from various places online, including Wendy's Generic Toe-Up Sock. Mods: None, aside from dropping a needle size (I'm learning that as a thrower, my knitting is a little loose, so I often need to go down a needle or two to get gauge). Oh, I did make the fingers longer, as we Wilsons have loooong fingers and toes. 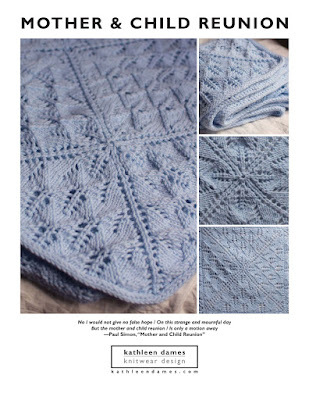 I liked this pattern and plan to knit Julia's Entangled for myself when I wrap up Holiday Gift Knitting (hereafter referred to as HKG). My original plan for this yarn had been socks for my grandmother, as she told me the Amy March Slippers I knit her for Mother's Day never even went in the drawer but right onto her feet. But then I heard some felting stories from folks who had knit socks with this supposedly superwash yarn only to end up with ornaments and didn't want that to happen. So for HKG I may knit Grandma a pair of socks from my STR stash. Yes, I may knit socks. In fact I'm knitting myself a pair now, and it's not as tedious as I thought. I'm doing toe-up with Judy's Magic Cast On and plan to do a short row heel. The yarn is some gorgeous Madeline Tosh in the Twilight colorway from Purl Diva. Tomorrow I'll try to blog the Surprise Jacket and Bootees for my nephew, but Penelope has had a cold, so it's a piecrust promise: Easily made, easily broken. Wish me luck.